Red snapper fishing is fun. There are many different species of fish you can target and catch while deep sea fishing in Alabama. Depending on the time of the year you come fishing, these fish may or may not be in season or available to harvest. If you have chosen Catch and Release as your preferred trip intention and you catch a fish that is in season, you are welcome to keep it for dinner. 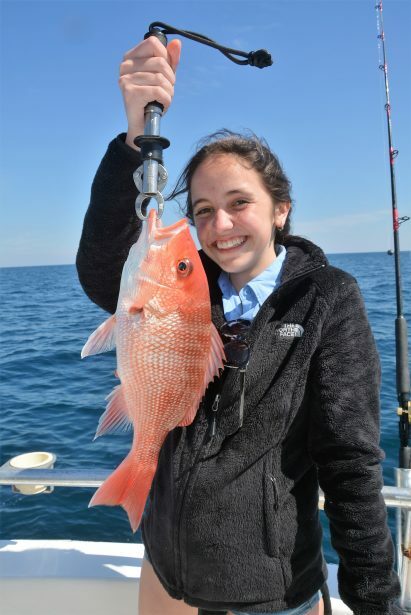 The most common species we catch on 6 hour trips are red snapper and triggerfish. They are what we call reef fish. There are a few other species of reef fish like amberjack, grouper, vermilion (beeliners) and red porgy you can catch on longer trips. There also those seasonal migratory species (bonito, cobia, king mackerel, spanish mackerel, wahoo and dolphin fish) that enter our waters at different times of the spring and summer or when water temperatures and spawning conditions are right. What you need to know, is depending on the time of year you want to go fishing, you might not be able to keep all that you catch or any of the fish you catch. Reef Fish Species we commonly catch: Dates and Seasons To Be Announced. Red Snapper – Opens June 1 to approximately August 1, 2019. dates subject to change. Expect to catch a lot of 12″ to 17″ fish weighing 2-4 pounds each. Some are larger. The best trips are 6 hours. 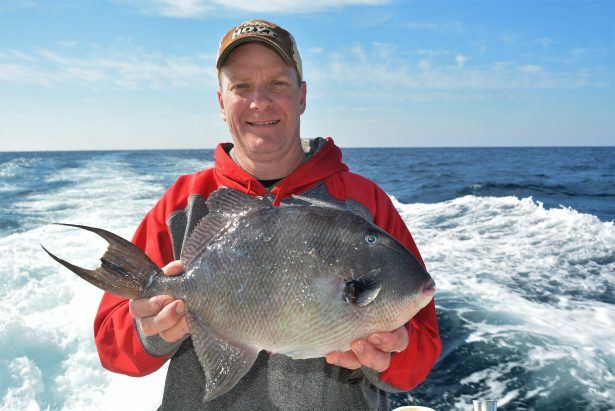 Gray Triggerfish – Opens March 1 – May 10. Bag limit is 1 per person with a 15″ fork length size limit. 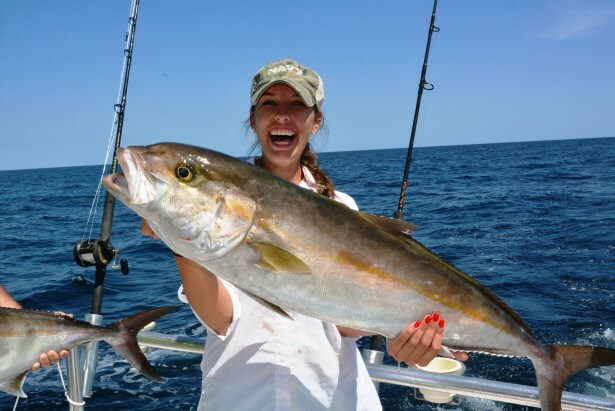 Greater Amberjack – August 1 and will close October 31. We get a new allocation of quota on August 1 and the season should remain open until the end of October. This is a full day trip. The limit is 1 per person and the size is 34″ total length. Vermilion Snapper and Red Porgy – 10 hour trip – Open Year Round, but these fish are small (10″ to 12″ in length) and our customers tell us they don’t really care for the flavor or the little fight they offer – So, we most of the time don’t target them unless our customers absolutely want to keep something for dinner. Kingfish or King Mackerel – Open year round, but they don’t usually show up here until late May or mid June each year. This season is usually good until late October each year. Spanish Mackerel – Open year round but they are only around from mid April to October. In April and May, they are small when they migrate through during late March and April each year. They hang around all summer and we really catch some big ones during the fall while they are migrating back toward south Florida. Mahi Mahi – Dorado – Open year round, but these fish grow very quickly and usually show up around mid to late July each year when water temperatures get above 80 degrees. If we see some debris or trash floating, you can almost be assured to see some around. 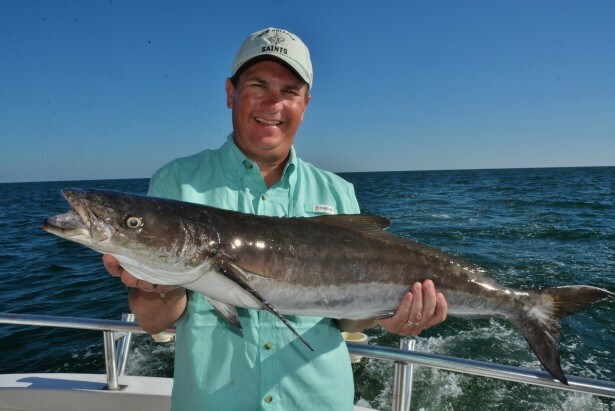 Cobia – Ling – Open year round. These fish migrate through our waters up near the beach during the middle of April. 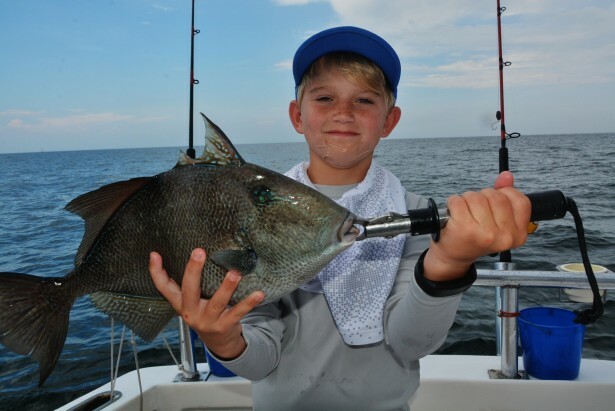 By May of each year, the migration is over and the fish that are left in our area, settle in on our artificial reefs located some 8 to 40 miles offshore. These fish are really a brute to fight. Tuna – We don’t catch them on our boat. This type of fishing is done primarily on overnight and multi day trips way offshore like 100 to 140 miles. Since we fish 6 hour trips, we don’t hardly ever catch tuna. Our job as professional fishing guides is to provide safe access to, give you reliable transportation to and from the fishing grounds, and give you a reasonable chance to catch them. If your motivation for going deep sea fishing is to have fun and learn how to catch some fish, we are the charter boat for you. All we promise you is that we will do our best to keep your rods bent and have you reeling in some fish. If you are wanting to catch and bring a bunch of fish back to the dock, you need to keep reading below, so you will know when to book your trip. We may not be the guide for you. Filling freezers is not what we focus on. We focus on family and kids having fun fishing and keeping a few for dinner or releasing them. Now, there is no such thing as filling the cooler anymore with species like snapper, grouper, amberjack and triggerfish. That is because most of the fish we catch have seasons that are extremely short and some of them are not open each year to harvest. Now, if you are like us, we can certainly catch and release any fish you catch that may be out of season. You may be wondering what your chances are at just catching some fish? There are a lot of factors that determine your success. They are: The experience level of your crew, the length of trip, distance traveled offshore, water temperature, weather, moon phase, what time of year you want to go fishing and most importantly, if you want to harvest them, they must be in season. The most popular reef fish species that live in our waters are red snapper, triggerfish and greater amberjack. They are all highly regulated and have very short seasons for harvest because so many people fish for them. However, if keeping fish is not your primary reason for going fishing, they all can be caught, photographed and released, no matter when you are in town. In Orange Beach, anytime of the year is good to go reef fishing. It is the summer months and fall months when fishing is the best and more varieties of fish species are abundant. 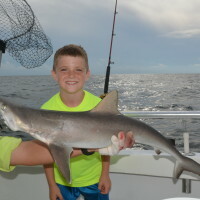 We specialize in half day trips for first timers and families, and because of time constraints, we usually fish no further than 20 miles offshore or away from land. 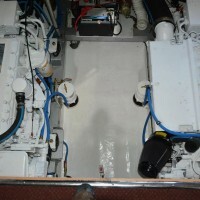 We are different than other charters in our area. We teach and encourage new anglers. We take people who have never fished before and give them an opportunity to learn how to catch saltwater fish. Just because we are family friendly, doesn’t mean you get any less of a trip. You actually get more, because we are like a coach or a mentor. Our job is to educate, demonstrate and allow you to learn how to catch different fish species that are available to us. We don’t yell or holler at you if you make a mistake or lose a fish. Being a family man, that is very important to ensure you get the best service in the industry. 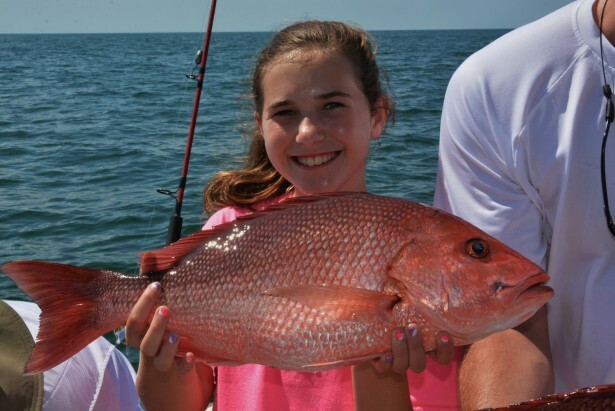 On half day trips taken anytime of the year, our guests commonly catch: red snapper, triggerfish and amberjack. All of which, the species are highly regulated and have short seasons and quotas or low bag limits to ensure we don’t over harvest them. During the summer and fall months, we also catch king mackerel, spanish mackerel, bonito, jack crevalle, remora, cobia, vermilion snapper, red porgy and sharks. These fish have more liberal bag limits and seasons than snapper, triggerfish and amberjack. We also can catch migratory fish like wahoo and mahi mahi during the late summer and early fall months when pretty water pushes in from the southeast. 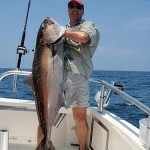 Grouper are usually caught on full day trips while fishing over natural bottom, or beyond 35 miles offshore. We don’t catch tuna, swordfish, marlin or sail fish on half day trips. Those are big game fish are caught way offshore on overnight, two or three day trips. If catching fish like that are a priority, we can direct you to someone who specializes in big game fishing. 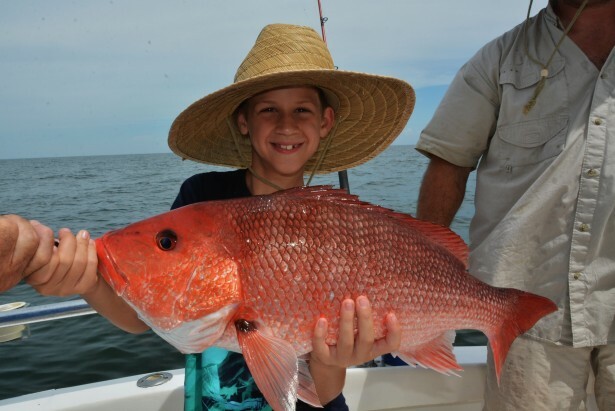 We love to see children go through the steps of learning how to catch red snapper. For those of you who want something to eat, you need to know that the fishing seasons change each year and it is easier for us to point you to the Gulf Council Website. This governing body is the ones responsible for setting seasons and bag limits in federal waters (where we mostly fish). We have strict quotas that we have to stay within each year, so we will continue to have fish in the future. Even though you can’t always harvest them, we can certainly take you to catch them, take a photo and then release them. 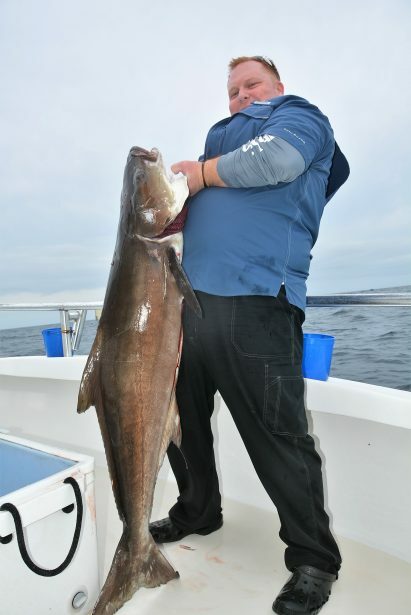 Cobia (Ling or Lemon Fish) are a migratory fish that move into our waters in the late spring of the year. They are a game fish and offer one tough fight. They are caught sight fishing and deep sea fishing. They must be 33″ at the fork to catch. Food quality is excellent. These fish are not always available to catch. They show up in mid April and some stay around until October each year. 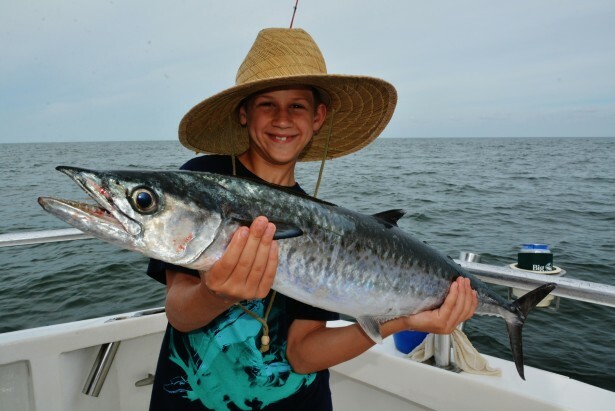 King mackerel are a very tasty fish that we catch while trolling to and from the fishing grounds. They must be 24″ fork length and you can keep 3 per person. Younger fish from 24″ to 30″ are best for flavor and human consumption. 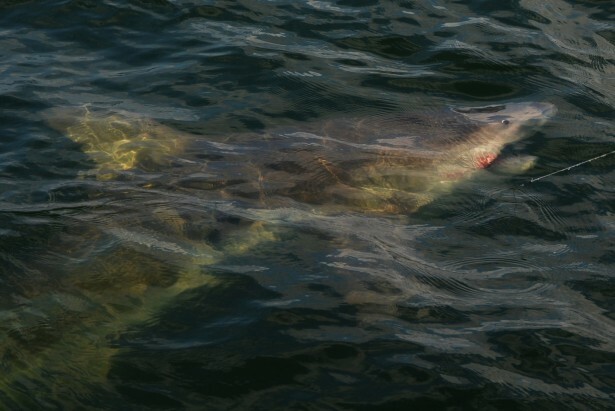 These fish show up when water temperatures reach about 70 degrees which is usually early to mid June and they stay around until late October each year. 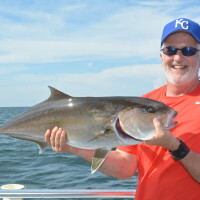 Greater amberjack are a fun fish to catch. They are called sea donkey’s because of how hard they fight. The limit is 1 per person and must be 34″ fork length to harvest. They are commonly caught while deep sea fishing. We do catch some on half day trips but many are under size in that area. Food quality is good. These fish are usually in season to harvest from August to October each year but seasons close based on harvest rates. Trigger fish are commonly caught while deep sea fishing. The limit is 1per person and they must be 15″ fork length to harvest when the season opens back up. The food quality is excellent. The seasons are often short each year or during March to May 31. They fight hard and we will show you why they are called trigger fish when you fish with us. 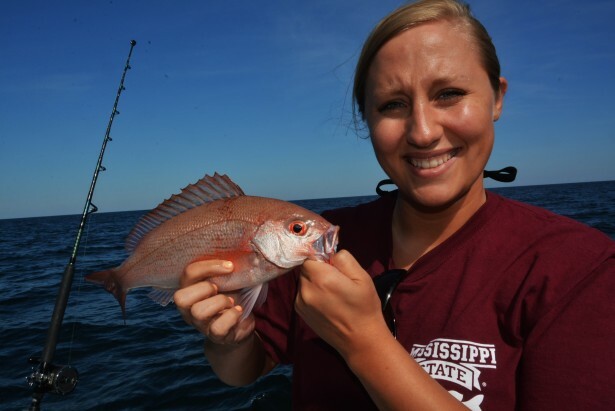 Vermilion Snapper (Beeliners) are commonly caught while deep sea fishing. The limit is 10 per person and they must be 10″ total length to keep. The food quality is fair to ok. These trips require more riding time to get to the natural bottom where they live. Most of our customers had rather fish for larger fish that they had to release, but if harvesting fish is a priority, this is one we can target. It takes a lot of bait in the water to get them to start feeding, so everyone would need to participate to ensure you have a chance to catch a few. These fish are open to harvest, but do you really want to spend / invest that much money to just harvest bait size fish? This is a rare 29 pound red snapper and is approximately 20 to 30 years of age. Larger ones live to 57 years of age. It is a trophy fish in anyone’s book. Because this fish is a big sow and a big egg producer, we give you the option to photograph and release or keep and eat. Food quality is Not As Good as their younger counter parts. Our motivation for fishing is not to fill the cooler with a bunch of big, dead fish. Instead, we take you to catch fish, and if you are lucky enough to catch a trophy, and if you care about quality, more than having large quantities, we will then take time to educate you about the fishes food quality. Bet you never thought about how a big fish is not near as good to eat as a smaller fish. Just like choosing a good cut of beef, would you rather eat a steak off of a 10 year old steer or a 1 year old steer? I would rather eat a quality piece of meat myself and would always opt for the younger cuts of meat. That is because they are more flavorful and tender. If you catch a trophy fish, it does not matter to us if you harvest it or not. To us, fish are no different than a good steak. If you had rather have a quality fish to eat rather than a giant fish that is not a quality eating fish, we will ask you “what do you want to do with your fish?” If you say put it in the box, we don’t judge you and we will put it in the cooler. Those fish we catch belong to you and it is your choice as to whether you want to keep them or not. We do what you ask us to do, no questions asked. If you are not sure if you want a big, old fish to eat or are looking for guidance, that is when we will give you our opinion on what is best to eat. This way, you can make an informed decision on which is best for you. We don’t judge, encourage or discourage you. All we do is educate. After we quickly get a photo of you holding your big fish, you will then have to quickly decide if you want to only keep quality fish that are better for you or keep a fish that has a large quantity of meat (that may not be the best for you). We don’t frown upon anyone keeping a trophy size or giant fish. We have kept them in the past, but now that we know how important they are to future anglers and generations and want to make better choices ourselves. Triggerfish are fun to catch on 6 hour trips. They may or may not be in season while you are in town. You can certainly catch and release them. Our anglers catch some really big fish from time to time, and we love to see you smile when you get finally get it up to the boat after an exhausting battle. We really like seeing the excitement in ones eyes when we pull it out of the water. At the same time, we also recognize and fully understand how important big spawning fish are to the ecosystem and how releasing the big ones are to the future of the fishery. If you come with us, and you catch a big fish, it is our responsibility as professional fishing guides to inform you if the species you catch, are a quality fish and if you should consume it or not. Unlike almost every other fishing charter in Orange Beach, we don’t have to only harvest big fish to be successful in the charter fishing business. We are educators who see the big picture and strive to be better stewards of the sea. We want your grand children to have fish to eat. That is why we encourage you to take what you need, instead of what you can. We want you to know that when it comes to harvesting fish for the purpose of food quality, Bigger is not always better. For instance, a 16″ to 24″ red snapper is a whole lot better to keep and eat than one that is 24″ or 12 pounds or more? Everyone knows that a red snapper lives to 57 years of age. Even though there is a lot of meat on a big red snapper over 12 pounds, they are not near as good to eat as the younger fish. 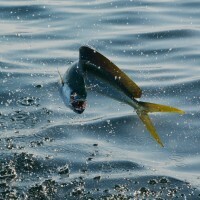 The same goes for king mackerel (kingfish), amberjack or sharks. Simply put, those younger fish that are 3 to 8 years old are better to eat than the older ones. We care if you have a quality fishing trip. Ultimately, it is up to you as to whether or not you want to harvest the fish or let it go. That’s because they are our biggest egg producers and are important to having an abundance of fish in future years. 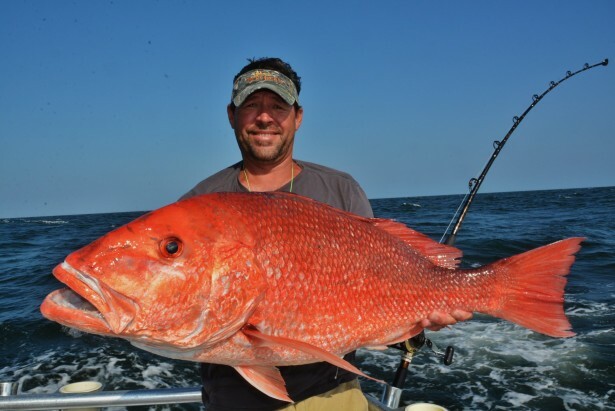 For instance, a 10 pound red snapper lays 212 times more eggs than a 16″ red snapper. This is really important because only 1% of the red snapper hatched ever make it to adulthood. Big sharks are fun to catch, but are not good to eat and would be extremely dangerous to put on board the boat with families. All our sharks are catch and release.